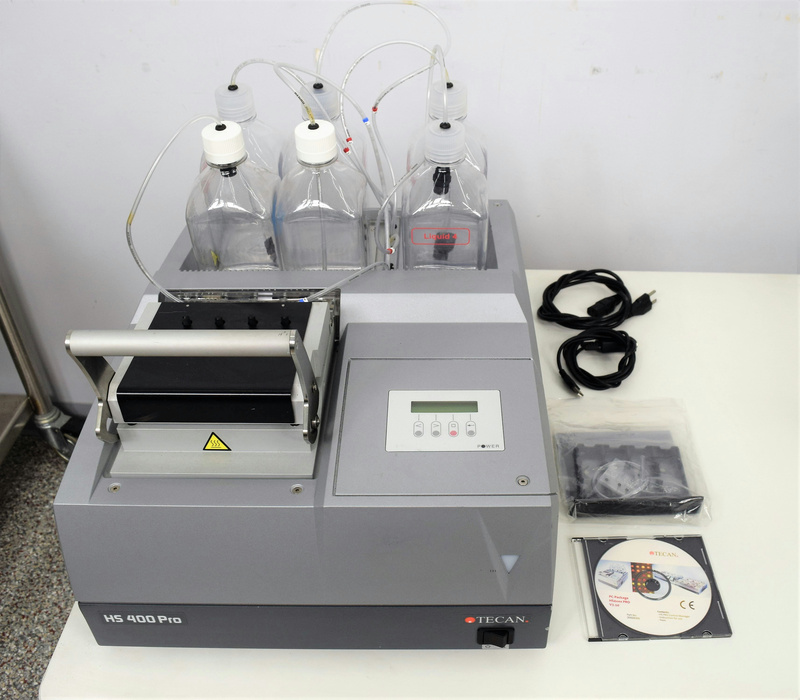 Tecan HS 400 Pro Hybridization Station Micro-Array Processor 30014587 Genomics . New Life Scientific, Inc. Processor, Six Bottles and tubing, Software, Interface Communication Cable for PC, Power Cord. Our on-site New Life Scientific technicians were able to power the processor on and you can hear the pumps working. The process standardization and automation achieved with the HS Pro are particularly advantageous for processing protein microarrays and segmented microarrays. The use of the HS Pro minimizes the incidence of artifacts and handling errors, consequently reducing variability and enhancing data quality. Protocols are available for numerous applications involving DNA, RNA, and protein microarrays.